We will explore how grassroots organizations can utilize free geographic information systems (GIS) to improve its program’s efficiency and better demonstrate impact to donors. By originating this process for Gardens for Health International (GHI), a Rwandan organization that works to provide sustainable agricultural solutions to health problems, we will produce 1) a model workflow for adding spatial references to existing indicators; 2) map where GHI works for development and communications purposes; and 3) conduct on-site trainings to facilitate GIS in the daily workflow of GHI. The goal of this project is to collaborate with Gardens for Health International (GHI) in order to collect data and produce maps that will allow the organization to incorporate spatial analysis into its work. 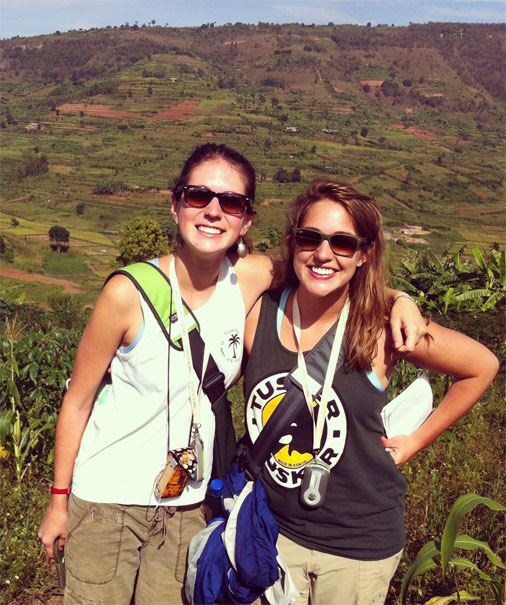 We propose to work with GHI at their headquarters in Rwanda this summer. While there, we will collect data using GPS devices, compile existing data into a database, learn as much as possible about the inner workings of the organization, talk with a variety of health professionals on the ground, and train American and Rwandan staff members on how to use Quantum, a free open-source GIS available online. MiddSTART funding will enable us to fund our travel, as well as buy GPS devices that we will donate to Gardens for Health. We are both passionate about the power of maps in global health work, because we see the enormous potential for them to be used as tools that highlight patterns in a highly visual and accessible way. The question of why disease, disaster, and social inequality occur in particular locations exposes the connections between geography, medicine, and public health. When displayed as maps, these connections illustrate how essential cartography and geography are to understanding and improving public health policy and planning. However, small grassroots organizations often do not have the capacity to implement these ideas. We aim to bridge this gap by working with an organization that we are already connected with through GlobeMed, and explore the possibilities for the application of GIS in the non-profit health sector. We will keep a blog while in Rwanda with as many photos, audio clips, entries, and maps as possible. We will also compile an email list of donors and send out a thank-you with a link to the blog, as well as an update from the field, and a final email with the finished products. Also, here is the link to a video we made about our time in Rwanda! Here is the link to our website for those who want to continue to follow our project: http://www.grassrootsgis.com. for example, although they not become as sick. Is this the basic hypothesis? Secondly, knowing where a health clinic is located isn’t of much use if it cannot be reached using available transportation. It would seem that this would be a major issue for many. I’m wondering if this problem will be addressed in some way. Thanks so much for your gift, and also for your thoughtful questions! Apologies for the delay in getting back to you. You’re certainly right about the fact that a balanced diet alone does not reduce one’s susceptibility to disease. Gardens for Health International (GHI) operates with the belief, however, that a balanced, nutritious, and reliable diet is the basis of good health. Although providing families with agricultural assistance may not necessarily solve their specific health problems – like malaria, which you mentioned – it can lessen the effects of these problems and also boost the immune system to prevent further health problems. Furthermore, GHI is committed to moving away from short-term food aid towards self-sufficiency. The main idea behind the work of this organization is to enable families to grow nutritious food for themselves, in a sustainable manner. Regarding your second question, about transportation to the centers — we completely agree. This is the root of the problem! Health care may exist, but is it accessible to those most in need of it? By making maps, we hope to start teasing apart this complex issue. The maps we make for and with GHI will allow the organization to visualize the catchment areas of the different health centers — how far are people traveling to receive care, for example? We’ll be recording the location of the health centers, but we’ll also be collecting data at the household level, which means that we’ll be able to see exactly where all of the different families live. So although we are not addressing this problem of inaccessibility directly, we hope that by working with GHI and incorporating GIS and spatial thinking into their monitoring and evaluation practices, we can pinpoint which centers are most or least accessible, and which patients are struggling the most to reach health care. Thanks again for your comments, and please let us know if we can answer any more questions!